I joined the GDS Academy as a facilitator in late 2018 and was excited to get involved immediately with developing a new half day course to introduce public servants to artificial intelligence (AI), which I will also be facilitating. The course is for anyone interested in an introduction to emerging technology and how this will impact government now and in the future. This is not a course for experts in the field, but rather for those who want to improve their knowledge, dispel myths and find out what can be (and is being) done in this field. In April 2018 the government published the AI sector deal explaining how they intended to place the UK at the forefront of developing AI. Since mid-2017, at least 20 countries have published AI strategies, aiming to place themselves at the heart of different strands of development in AI. There is no doubt that it is an important subject of the future. So what should a government who has invested heavily in digital transformation do? They should lead the way in the field of emerging technologies and the UK government is doing just that. The GDS Academy is putting itself at the heart of that progress with an expanded curriculum covering the new technologies impacting public services including our Emerging Technology Development Programme and our new series of masterclasses with prominent academics. In November 2018, James Merrick-Potter, head of robotic process automation (RPA) unit, Cabinet Office, explained how RPA in government is rising sharply, with Her Majesty's Revenue and Customs (HMRC) leading the way with 78 solutions using 13,500 robots who have processed more than 15 million transactions. RPA is the stepping stone towards AI where adoption will lead to intelligent automation. This will have an even greater impact on the transformation of government. The government is also investing £20 million in the GovTech catalyst. This encourages departments to identify problems that might be solved with an automated solution and support small UK businesses to develop those solutions. This new course will typically help public sector professionals understand how to identify what is ripe for automation. So should you attend this course? Yes! 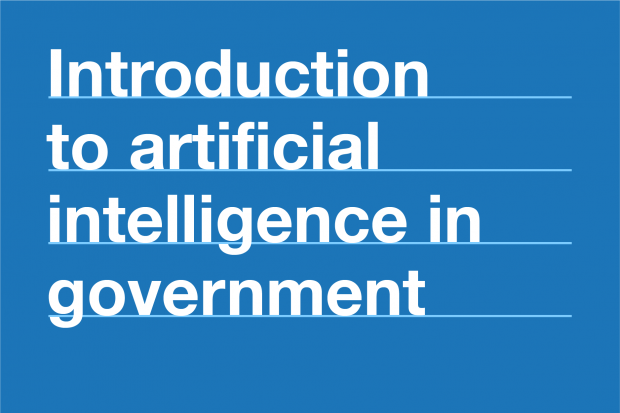 AI looks set to have a positive impact on government through potential for savings in cost, time and improvements in job satisfaction for all public servants, and this course will allow you to understand both the benefits and limitations of AI. Despite all this excitement, you may still be thinking that AI is a risky idea or are thinking that we cannot trust autonomous robots to make good, ethical decisions. And what about transparency? If this is you, I invite you to sign up to the course to discuss these ideas and find out how government can still be open and transparent as well as meeting its commitments to diversity and inclusion with autonomous machines. Find out more about the course, dates and location. The first course is on 13 March 2019. Follow all our latest news via our website and @GDSacademy, where you can also see the list of all our courses and programmes.